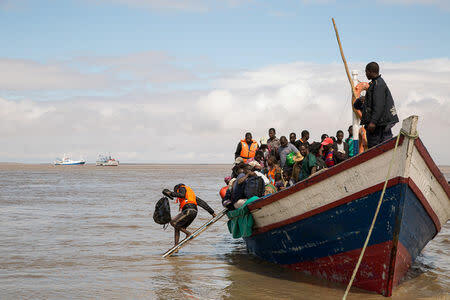 The death toll in that country was now 242, Land and Environment Minister Celso Correia said, adding that the number of dead was rising as rescue workers found bodies that had been hidden by Cyclone Idai's now-receding floodwaters. Correia told a news conference that around 15,000 people, many of them very ill, still needed to be rescued. "Our biggest fight is against the clock," he said, adding that 3,000 had been rescued so far. In neighbouring Zimbabwe, the confirmed death toll jumped to 139. President Emmerson Mnangagwa, declaring two days of national mourning from Saturday, described scenes of "unmitigated despair" in Rusitu, near the border with Mozambique. "This is a human catastrophe of the highest order," businessman Graham Taylor told Reuters, saying he had seen "hundreds of bodies that had been washed up by the floodwater" while trying to return home after visiting his son in Beira. "What struck me first was the number of people on the rooftops and in trees. You could hear communities shouting for help - for hours, for days," said Taylor, who also described meeting people on the badly damaged highways heading towards the devastated areas in search of family members. "It was a humbling experience," he said. "I saw no sign of government assistance." Even when people are safely out of the floods, the situation is dire. Some 30 percent of the 88 centres set up by the Mozambican government for displaced people still have no food, Environment Minister Correia said. Idai lashed Beira with winds of up to 170 km per hour (105 miles per hour) a week ago, then moved inland to Zimbabwe and Malawi, flattening buildings. The storm's torrential rains caused the Buzi and Pungue rivers, whose mouths are in the Beira area, to burst their banks. The United Nations World Food Programme (WFP), which is coordinating food drops, said as many as 1.7 million people in Mozambique would need food aid in the next three months. The scale of the flooding is huge - the U.N. satellite agency says floodwaters covered 2,165 sq km (835 sq miles) on March 20. Some 90 percent of the city of Beira was damaged, the WFP said, while aerial assessments over the Buzi valley showed "entire villages wiped out". Mozambique's National Disasters Management Institute (INGC) said some 358,000 hectares (885,000 acres) of crops had been destroyed. Thirty-nine hospitals had been damaged, it said. "Here in Beira, all the churches have collapsed from this cyclone ... Oh my dear brothers, please pray for us," said Pastor Luis Semente. "Only God can restore this." "More help is needed, and we are continuing to do all we can to bring in more resources and to reach more people," said Jamie LeSueur, the IFRC's operations head in Mozambique. Mozambique's tiny $13 billion (£9.9 billion) economy is still recovering from a currency collapse and debt default. The cyclone knocked out Mozambican electricity exports to South Africa, exacerbating power cuts that were already straining businesses in Africa's most industrialised economy.